Inspired by leaders before her Ambassador Barbara Barrett shares Arizona’s legacy of female leadership. (LtoR) Phyllis Senseman, CopperPoint Insurance Companies and Ambassador Barbara Barrett. From learning to fly F/A-18s to biking 900 kilometers around Finland, Ambassador Barbara Barrett isn’t your typical diplomat. Barrett has traveled the world but chooses to call Arizona home, citing the strong sense of community and long-standing history of successful women in leadership. 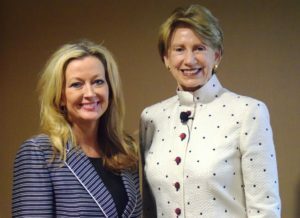 During November’s Professional Women’s Alliance luncheon, Barrett shared insight about her inspiring career as Ambassador to Finland and Arizona’s history of leadership by women. Barrett was appointed to office by then-President George W. Bush and confirmed by then-Senator Barack Obama in April of 2008 and served until January 2009. Her time as ambassador to Finland was nothing short of exciting. From paying visits to universities to learn about lasers, to doing work promoting women in the armed services, Barrett was as hands on as an Ambassador could be. As she we worked to promote female involvement in the armed services Barrett was tasked with learning to fly an F/A-18. She accepted the challenge and became the first female civilian to land an F/A-18 on an aircraft carrier. Ambassador Barrett proactively engaged with the citizens of Finland to create a strong relationship between its citizens and the United States. Barrett believes part of her job as ambassador was not only to make sure the Finland leadership respected the States but also that the citizens saw the United States in a positive light. Barrett has since held many roles including recently being named chairman of the Aerospace Corporation as well as serving as interim president of the Thunderbird School of Global Management in 2012. Barrett referenced various Arizona female leaders, such as her role model, Sandra Day O’Connor, noting their passion and hard work as keys to their success and source of inspiration for women. From Isabella Greenway, Arizona’s first congresswomen who served from 1933 to 1937, to Jackie Parker, the first female pilot to fly an F-16, Arizona’s tradition of supporting women in leading roles isn’t new. The next Professional Women’s Alliance luncheon will be on Tuesday, Dec. 6 featuring 2015 ATHENA recipient Melissa Sanderson, vice president of International Affairs, Freeport-McMoRan, Inc. Sanderson will share her unique personal and career journey starting as an investment banker and transitioning to diverse positions all over the world. Register today!